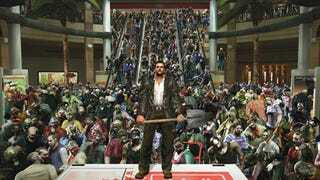 In the latest Bionic Commando podcast, there's a list of rejected Dead Rising Xbox 360 titles — plus a response why there's no photography in the upcoming Wii version. First, Bionic Commando producer and former head of localization Ben Judd runs through the rejected titles for the original Dead Rising. Wicked Dead, Born In Hell, Hell's Order, Scoop of the Dead, Paparazzi of the Dead, Shot of the Dead, Shoot and Shot, Run Over The Dead, Gluttonous The Zombies, Big Eater, Confidential, End Zone, A Shout Of A Soul, From Behind the Other World, From Darkside, Rock, Resistance, Apocalypse, Infection, Gateway, Sight, Not Found, Blackout, Escape, Code Zero, Exile, Zombie Report, Bad Report, Def Dead Time, Inferno, Dangerous Shopping, Escape From Shopping Mall, Shocking Shopping, Ten Days, X Days, Zombie Surround, Slow Stroller, The Besieged In A Mole [sp. ], The Death's Soul, Death Sentence, The Separated Soul, Revived Flesh, Hollow Eyes, Zombie Town SOS, Super Zombie Time, Panic Mall, Zombie Collector, Dead Town, Zombie Of America, Zombie Epidemic, Zombies, Man Eat, Scoop Snatcher, For Life, Photo Spirits, Journalist Spirits, Survive In A Mall, Isolation Town, Isolation Citiy [sp. ], The Body Which Wriggles, Dead Bee, After Dying, Deadly, Defect, Fatal Defect, The Dead's Ground, The End of Fair, The End of Practice, Bottom, Uneveryday, Did You See? I Saw, A Zombie's Party, Days Of Being The Dead, Frank West, Deathrow, First Death, Death Gunners, Satan Bell, Zombee, More Beef Life, Change of Lifestyle, Zombi, Dead Mole [sp. ], Zombie Shudder, Shutdown The Mall, Dead Easter, Scoop Boy, Libra Mall, Hell Mall. Our favorites: "Gluttonous The Zombies," "Def Dead Time," "Escape From Shopping Mall," and "Did You See? I Saw." This is a very different game, gameplay wise than the 360 version of Dead Rising. Another reason is the fact that the camera is quite different. In this version, the camera is very similar to what the players are used to in Resident Evil 4 — an over-the-shoulder camera that stays fairly tight behind Frank... [Photographing zombies] doesn't work so well with the tighter camera we have in Dead Rising Wii. Another factor is that the zombies in Dead Rising Wii are quite a bit more aggressive, so it wouldn't be nearly as easy for users to set this situations up [to take pictures of zombies]... You're not going to have the extra time you need to set up these cool situations with the camera. Nakai goes on to say that they were hoping to reach a new audience with new hardware and the photography element didn't add much to the Wii version of the game. The in-game text, however, is bigger and the game is "more user friendly."